Anton J. Puch, “Tony”, 92, of the Town of Port Washington died November 14, 2008 at his son’s home in Gibbsville with whom he had been living with the past 18 months. 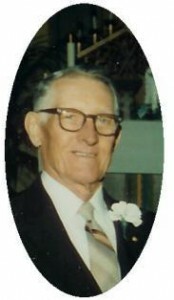 He was born on October 27, 1916 in Livingston, IL to Andrew and Sophia Repovesch Puch. At the age of four, the family moved to Jackson County, WI. He served in the US Army as a Tank Mechanic in India and Burma during World War Two and received the Bronze Star. He married Amanda Maceil of Pittsburgh, PA on May 12, 1945 in Jackson, MS. He began work at the Wisconsin Electric Power Plant in Port Washington as a maintenance mechanic retiring in 1979 after 34 years. His wife Amanda preceded him in death March 3, 2006. Tony was a life member of the Ozaukee County Memorial Post 5373 VFW and was also a member of the International Association of Operating Engineers, Local 317 and the Employee Mutual Benefit Association of Wisconsin Electric. He was also a longtime member of the Indian Hill Snowmobilers of Grafton, logging many miles throughout Wisconsin. He enjoyed bow deer hunting and working in his large vegetable garden. He is survived by his sons Kevin (Debra) Puch of Key Largo, FL and Jerry (Donna) Puch of Gibbsville, his grandchildren, a brother Emil Puch of Phoenix, AZ, nieces, nephews, other relatives and friends. He is preceded by his wife Amanda, infant children Daniel and Beverly, son Steve and a sister Emma. Tony will be laid to rest on Sat. Dec. 13, 2008 at Union Cemetery in Port Washington at 9 am. Ozaukee County Memorial Post 5373 VFW will perform military honors. Please meet at the cemetery (the corner of Keeney and Chestnut Streets, Port Washington). Special thanks to Hospice Advantage of Sheboygan for the kind and loving care. Memorials to Hospice Advantage of Sheboygan, 3325 Behrens Pkwy, Sheboygan, WI 53081 are appreciated.